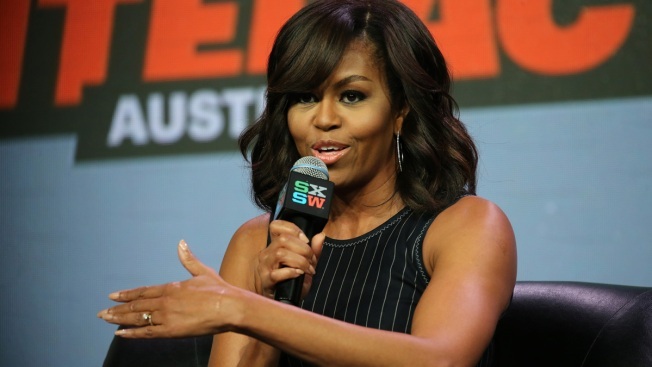 Michelle Obama showed off her vocal chops at the South by Southwest Music Festival but drew a round of disappointed sighs when she told the crowd she has no plans to run for president. Mrs. Obama says she'll most miss interacting with people as first lady — but says she has no presidential aspirations of her own. "No, no. Not going to do it," she told the packed convention center crowd in liberal Austin. "The daughters of a president. Just think about it. Come on, young people. Not so easy," Mrs. Obama said. "They've handled it with grace and with poise, but enough. Enough." President Barack Obama opened the festival last week with a talk about civic engagement, becoming the first sitting president to attend SXSW in the festival's 30-year history. He weighed in on Apple's legal fight against the federal government over encryption, and told a crowd of tech enthusiasts that Republican lawmakers in Texas aren't interested in making voting easier. Mrs. Obama steered clear of hot-button topics. She instead promoted her "Let Girls Learn" initiative, which encourages world leaders to provide education opportunities to an estimated 62 million girls globally who do not attend school. She also says she won't disappear from public view or slow down once she leaves the White House next year. "Sometimes there's much more you can do outside the White House without the constraints, the lights and the cameras, and the partisanship," Mrs. Obama said. "There's a potential that my voice can be heard by people who can't hear me now because I'm Michelle Obama, the first lady. I want to be able to impact as many people as possible in an unbiased way to try to keep reaching people. I think I can do that just as well by not being president of the United States."